Doctor Who fans are enjoying a richly layered Series 9 so far this autumn, with plenty of nods to classic Who and a fabulously creepy two-parter that concluded on Saturday. I resisted the temptation to share Richard Hopkins‘ amazing K-9 build blog here when I found it a while ago, because I thought it’d be best appreciated alongside the superb screen presence of Peter Capaldi’s Twelfth Doctor to remind us what a wonderful fictional universe this is (not everyone agrees with me about Capaldi, of course; note, though, that I’ll be moderating the comments scrupulously). While some projects might occupy a few entries on their author’s more general blog, it’s easy to appreciate that the scope of this project, which has been ongoing since May 2014, warrants a blog all to itself. A Raspberry Pi as the brains of the robot was part of the project from the very beginning. It controls K-9’s expressive, servo-driven ears and tail as well as the scooter motors that move him around, runs Node-RED to allow browser-based control and to display a power monitoring dashboard on the panel on his side, and lets him to respond to voice commands and hold a basic conversation. A Raspberry Pi camera module on a long cable sits behind his eye panel. Who wouldn’t want to share their home with a robot like this? The addition of a wagging tail, side monitor dashboard and eye camera is significant progress. 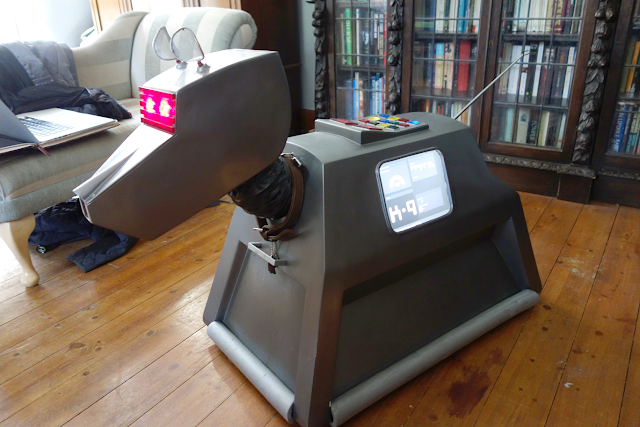 As fantastic as Richard’s build is, it’s not the only homemade, Raspberry Pi-powered K-9. William Reichardt’s wooden-bodied K-9 is tricked out with a thermal printer in its head; and if, like me, you don’t have the time or the technical chops for a project this complex, you can still house your Raspberry Pi in a fine LEGO K-9 case. Meanwhile, if the current series of Doctor Who has seen the Doctor swap his sonic screwdriver for a pair of sonic sunglasses (they look great, but we’re hoping they’re not forever, yes? ), fans seem committed to the classic tool. 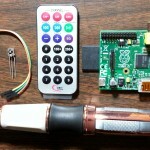 I found four different Raspberry Pi-powered sonic screwdrivers for everything from door locking to a TV-B-Gone, after which I stopped counting. Alan O’Donohoe has made a Raspberry Pi-controlled Dalek that responds to Twitter, a Doctor Who story premise that I never want Stephen Moffat to consider. 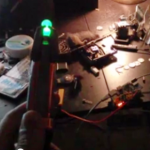 Last of all, something we can’t leave out of any conversation about Doctor Who-related Raspberry Pi projects is Dave Akerman‘s TARDIS. OK, so it’s hard to call this a fully working prop; it’s pretty small on the outside to begin with, and then the inside is, if anything, a little bit smaller. However, with the help of a high altitude balloon, it did fly to the edge of space, which counts for a lot with us. This might seem like the kind of thing for which you need long experience, and it’s true that a HAB flight demands some months of preparation. 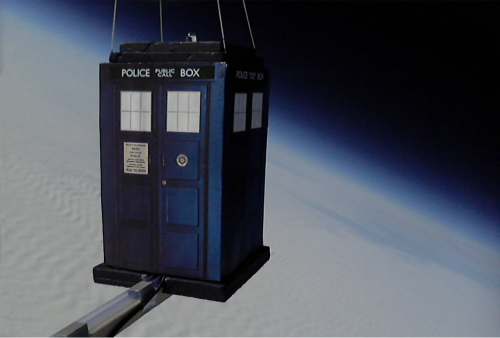 But having seen our first few successful launches following this summer’s Skycademy training for educators, we know that a stratospheric TARDIS is something that’s within the reach of primary schools. Ultra-Who-fan here, admiring and envious of all! K-9 has always been a favourite. Keep ’em coming! None of this relates to the blog post, it is entirely opinionated bo**ocks about Dr. Who. But I did watch the first episode in 1963, so do induge me, it will only take 20 seconds. But I hate the sonic sunglasses. As bogus a name as the VPL ‘eyephone’, I hope they are not long for this world. That guitar is nice. It’s like a Mosritibanezcaster. I will miss Clara a lot, she’s been great. But maybe a bit heartless, she got over her brutally murdered boyfriend a bit too fast methinks. Maisie is LOVELY, as is her totally charming brother by the way. So next week should be a corker. Next time I come on here I’ll try to stay a bit more on topic re Pi, edjumacation, etc. But really, it’s Doctor Who, it means a lot to me, I had to throw my 2p worth in. Danny Pink was an AWFUL boyfriend. Go Team Clara. Re. Danny – I sometimes wonder if there is a whole plot arc they are about to unload on us to get rid of him altogether. He seemed not real, and indeed rubbish, the whole ‘Cyberdust’ / dead rising thing was preposterous, and it would be nice if they retconned the whole episode away, him included, whilst simultaneously bringing back – SWOON! – Osgood. Yes Osgood!!!!!! We need her back!!!!! Malcom Tucker as Dr Who was a fantastic idea – but that is as far as it got. I’m not only enjoying Mark Gatiss penned episodes now – and he would be the perfect next Doctor too. WHAT DO YOU MEAN NEXT DR ???? THERE IS ONLY 12 REGENERATIONS EVERYBODY KNOW THAT !!!!!!! 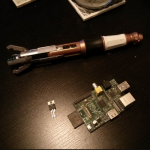 The Pi-powered props are wonderful, and I’m definitely with you on Mr Capaldi, Helen! One of my very few claims to fame is that I went to school with Clara: I can say with confidence that a girl who has been through high school in Blackpool can take anything the universe has to throw at her. or was that just me. WHAT IS A RASBERRY PI THING ,,,,IM NOT TOO SURE ???? That K-9 is quite a work of art! Impressive. I went to one scifi convention in Philadelphia some decades ago. 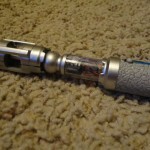 I was surprised to see more than one “actual” size of sonic screwdriver. I was told they used larger props for long shots, so it would show up better onscreen. That is a very interesting piece of trivia! I’ll be trying to spot that now. Love the real life K-9! Capaldi is growing on me. Just like Matt Smith and David Tennant did. I also hope that the Sonic sunglasses are gone soon. I didn’t like how Clara got over Danny so easily either. I do like that the “round things” have come back in full swing! Thats great …. does it have the laser gun ?